Diversity is widely acknowledged as a positive force in the business community today, with anti-discrimination laws established in workplaces around the world. Yet formal equality does not mean fair representation or the absence of prejudice. 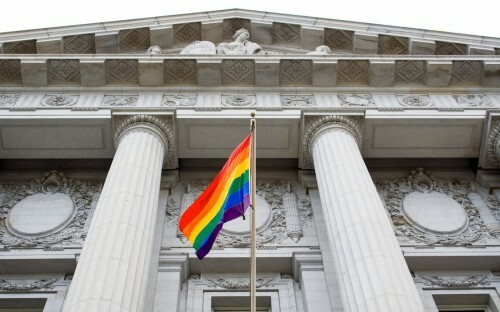 While many corporations have enshrined progressive measures, a lack of awareness and active bias against sexual minorities lives on in the workplace, in schools, and wider society. Over 20 states in the US have laws protecting workers from discrimination based on sexual orientation. However, teachers are restricted from talking about LGBTQ issues at school in eight states. Some advances are also slowly being reversed by the Trump administration—analysis shows that nearly one-third of Trump's judicial nominees last year had anti-LGBTQ records. Across the pond, a report by Stonewall highlights that in Britain almost over a third of LGBTQ staff have hidden their sexual orientation at work because they were afraid of discrimination. One-in-eight trans employees have been physically attacked by a customer or colleague. Equality in law is crucial, but equality in real-life means targeting internalized biases. Michel Anteby, associate professor at Boston University Questrom School of Business who has also taught at Harvard and Yale, explains that, as early as 1897, it was suspected that gay men were drawn to certain types of jobs. "But it was only in 2008 that the American Community Survey, one of the largest US surveys (other than the census) started tracking data on these questions," he says. This lack of data led to lack of research on the community which could have informed policies addressing issues they faced. "In a fairly conservative academic environment, I suspect that some faculty thought twice about pursuing research on LGBTQ workers,” Michel continues. Luckily, this is no longer the case. Michel’s own research shows that gay and lesbian workers are overrepresented in certain occupations. Whether it is because they choose these lines of work, or whether employers select them for these jobs, Michel says the LGBTQ community go into careers that others are less likely to pursue. For Michel, the reason business schools should try to cater and attract LGBTQ students is simple: “Majority members might learn a lot from them." Omitting the community from business school curricula, cohorts, and faculty, leads to blind-spots and missed opportunities. “LGBTQ-focused initiatives open the door for schools to discover new, less-represented worlds,” Michel continues. It also signals to them that they are not confined to certain roles and can pursue a wide array of jobs. This year, Smith School of Business at Queen’s University is hosting a new LGBTQ Executive Leadership Program—the first of its kind in Canada. The program is part of a Diversity and Inclusion Professional Series launched by Smith's Center for Social Impact. Tina Dacin, director of the center, says that while Canada's boardrooms are becoming more diverse and inclusive, progress is slow. She cites data from the Canadian Board Diversity Council's 2017 Annual Report Card as evidence—the number of respondents who self-identified as LGBTQ serving on the boards of the country's highest revenue-generating companies decreased from 2.1% in 2016 to 1.6% in 2017. "LGBTQ businesspeople face a unique set of challenges in the workplace," Tina says, "whether it is facing bias, or feeling that they cannot be their true selves." Over the course of the week, the program aims to help participants develop their voice as leaders, manage workplace bias, and build networking strategies. Monolithic and one-dimensional perceptions of leadership are being questioned today in companies at the forefront of disruptive trends. In this context, programs nurturing alternative yet highly effective styles of management are in line with progressive challenges to the concept of leadership. In 1998, students from Harvard Business School and Yale School of Management realized that while prominent associations existed for other diversity groups, there was not one for the LGBTQ community. They decided to address this gap, and organized the Reaching Out MBA (ROMBA) conference for students. In that year, around 90 students from six different schools participated in the event. Today, the conferences host over 1,800 students from business schools around the US. Reaching Out is now a year-round non-profit organization seeking to educate and inspire LGBTQ students to be the next visible leaders of the community. Matt Kidd, Reaching Out's Executive Director, explains that people often falsely assume the LGBTQ community is homogenous and unified. "The reality is that there are different segments of our community where we know less about each other," he says, "for example, gay cis gender men might not know very much about transgender issues. Building awareness within our community is critical to what we do." Through their various initiatives, Reaching Out aims to nurture a robust professional network, and enable participants to develop distinct leadership styles. "Leadership might mean being a CEO of a company, but it's so much more than that," Matt says, "it can take the form of encouraging people to give back to the community through donating or volunteering their services and time." While conferences seek to create an empowering environment for the community, the Reaching Out Fellowship provides a scholarship and access to a leadership development program for self-identifying LGBTQ students. Matt says that Reaching Out will continue to build better pipelines to business schools for the LGBTQ community and enable authentic leadership of the future. As business schools begin to take LGBTQ representation more seriously, b-school initiatives should have positive spill-over effects on wider society as well.